Chalk comes in several forms, depending on your preference. It’s all magnesium carbonate. For a clean solution where you don’t end up dusting your entire gym with stray chalk, put some chalk (any form, broken, blocks, doesn’t matter) into a long sock or a pantyhose. A light squeeze will release enough chalk out onto your hands. Keep the sock in a bucket and you can keep your gym pretty clean of chalk for a long time, other than the chalk that falls off your hands. If your old socks aren’t working well for this, you can get an inexpensive chalk ball from Amazon that is made for exactly this purpose. There is such a thing as using chalk too often. For long, heavy workouts with pull-ups, olympic lifting, gymnastic ring work or kettlebell work, you are going to rip your hands up. The thing is, chalk results in more friction, which leads to more heat buildup, and as anyone knows who has ripped up their hands by sliding down a rope, this combination of heat and friction is bad. So it’s a compromise. If you don’t use it, you may lose your grip, but if you do use it, you may tear a few layers of skin off hands and ruin your workouts for weeks to come until you heal. Develop really good grip strength and prevent your need for chalk. Deadlifts, particularly heavy ones, are one exercise where chalk may be a good idea most of the time. Your hands stay put, and that’s ideally what you want to use chalk for, situations where you do not want your hands to move at all. Olympic lifts, kipping pullups, and some kettlebell exercises are the opposite – you want your hands to slide around easily – so chalk does not make a whole lot of sense except maybe for some max attempts. Another way of preventing hand tears is limiting the amount of chalk you use. You want enough to keep your hands dry and provide enough friction for a good grip, but if your hands are going to be sliding around during the exercise, you don’t want so much chalk that you tear your hands up more easily. Experiment with it. That being said, if you use chalk regularly and toughen up your hands from all the friction over months and years, your hands will be more resistant to tearing, and you may be able to use as much chalk as yo want. Wristbands may help avoid the need for chalk, or as much chalk. Wristbands are made to soak up sweat and keep them from getting on your hands, the same way a headband keeps sweat out of your eyes. Don’t feel goofy about it. Just do what you need to do. 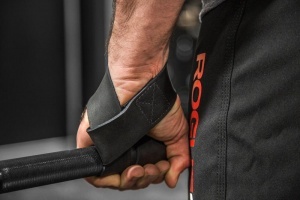 For deadlifting, lifting straps are another good solution. The strap has more friction than the bar against your hands, so you can up the amount of weight you can lift substantially. And I have to mention the elephant in the room. Gloves. Gloves have been one of the most popular accessories in gyms for years. They usually protect your hands, but they also weaken your grip A LOT. If they are simple gloves without padding, they can rub against your hands enough cause tears when doing pull ups and some other exercises. However, gloves can be useful for some purposes, such as rope climbs (rope burn is no fun if you lose your grip) and kettlebell exercises, depending on your form with the kettlebell and the quality of finish on the kettlebell handle. Beyond chalk, see Matt Kingstone’s “hand care” article at StrongFirst.